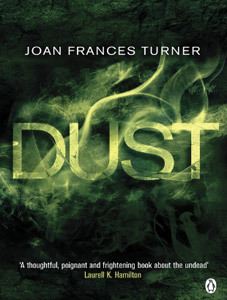 Dust tells the story of Jessie. Jessie was once a vegetarian, now she eats fresh meat. You see, Jessie was killed in a car accident and has now clawed her way back as a zombie. Now a member of the zombie gang the Fly-by-Nights, she roams the dark places where humans fear to tread. These are not your typical mindless shambling zombies: they think, have emotions and live as one. In fact, if it wasnâ€™t for the smell and the pieces of rotten flesh that fall off them, you would think they were still human. As is wont in these sorts of novels, something appears to threaten the fragile balance between humans and zombie kind. In this case it is a disease that turns its victims into something in between. The book is well written and the author has created a well developed world, with a plot and narrative that is fast paced and easy to read. The author does a good job of making the zombies sympathetic, even though the zombies themselves are devoid of all sense of emotion. Plus, it is great to see a variation on the tired and overused zombie genre. However I donâ€™t think I was the target audience for this book. I wouldnâ€™t go as far as saying itâ€™s Twilight with zombies, but I do think fans of that book would get a lot more from this. All in all a decent read, just not my cup of tea.